Comeon! are relative newcomers to the online gaming world but they have made a strong start and are certainly well worth joining. They are yet another operator located on the fine isle of Malta, and whilst they are licensed and regulated by the Lotteries and Gaming Authority of Malta for part of their casino product, they also hold an e-gaming license in Curacao for some of their casino games and the poker and sports betting operation. Anyway, that’s more than enough about licenses, let’s move onto things that really matter. Comeon (they only get their exclamation mark the first couple of times) are a thoroughly modern provider that don’t take things too seriously and like to keep things simple and fun. The site has tailored versions for several Scandinavian countries, as well as Australia, Poland, the Netherlands and, winning a prize for randomness, Chile, although we suspect this is actually a generic Spanish version. No software download is necessary to partake in their casino or sports offerings but the poker will require some software shenanigans, although it’s all simple enough. Customer service is available by live chat and an excellent callback option (which is fully international), both of which are available 24/7, as is support via their Twitter account (supposedly – we didn’t tweet them at 4am to check). With an excellent FAQ and search facility too answers are never far away at Comeon and this is one of their big strengths. 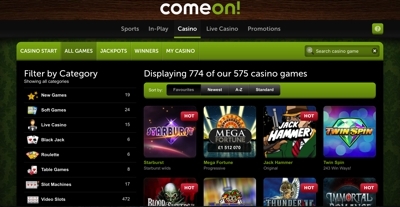 Overall Comeon score pretty highly and for a site that is so new (they were only founded in 2008) they have grown very quickly. Much of what they lack will almost certainly come with time, and by this we’re thinking about things like a mobile platform, a wider range of markets in the sports book and a little more in the way of promotions. However, what they do, they do well, so Comeon down! At ComeOn you can earn loyalty points on all of your activity in the casino, including simply for logging in and depositing! These points can be used to enter lotteries, purchase casino bonuses or turned into some free money. There are also two casino tournaments a day, which take place on a variety of different games. In terms of games, the casino offers suites from NetEnt, Microgaming, and Sheriff Gaming all seamlessly integrated into one instant play product which you access through your browser.